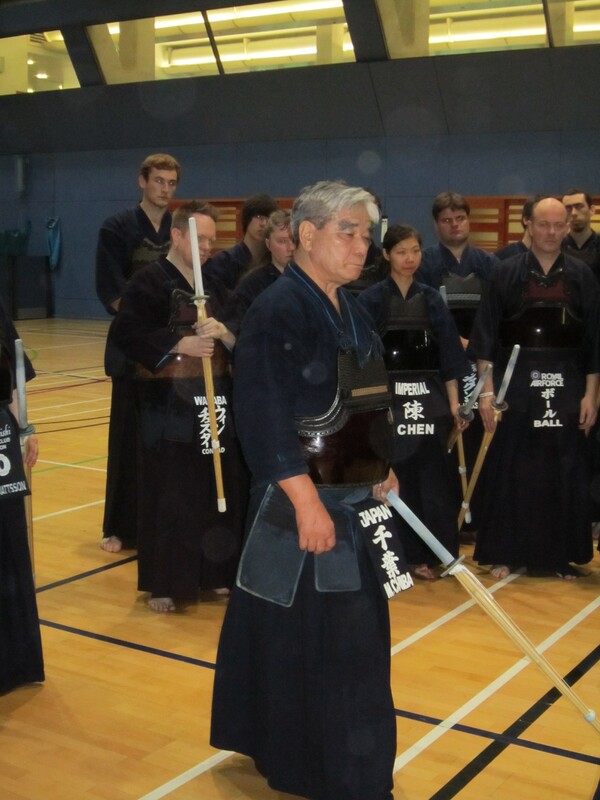 Chiba sensei is back in the UK for his annual visit. He has an unerring ability to quickly spot what needs fixing and to offer a remedy. After two dojo visits for keiko, he reached the conclusion that may UK kendoka suffer from the lack of coordinated ki-ken-tai-ichi. This stems from a number of timing problems but mainly from using too much shoulder power and leaning in, causing the right foot to come up rather than forward. Over the weekend he then ran a two day seminar. 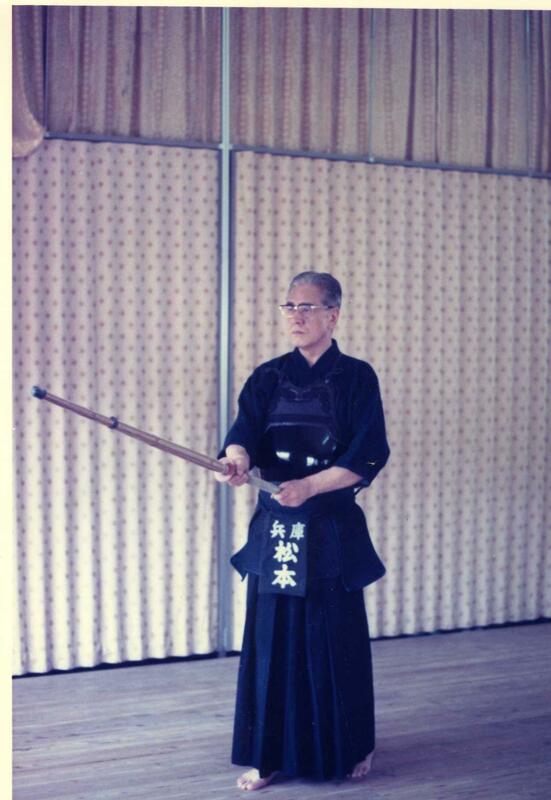 Using a series of drills that progressed through the range of shikake and oji waza at different speeds and distances, he made people work on developing a natural kamae and cutting motion to eliminate this problem. The theory is quite simple, in that you should relax your arms and shoulders in chudan leaving your inner arms close to the body so that you cannot see daylight between your inner arms and your dou. 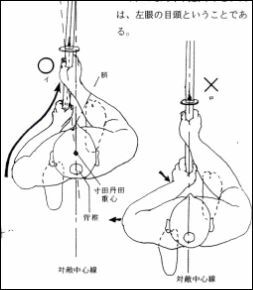 Your left hand should be at navel height and turned in at an angle where you can easily support the weight of the shinai. Your right hand should be held at a relaxed angle without being forced, so that you can move the shinai easily. The grip from both hands comes from the little and ring fingers only. You should step into your own one step cutting distance with a feeling of seme and at the right time you should lift the shinai bending your elbows and wrists in a natural fashion. How high you lift the shinai depends on you. If you are an experienced kendoka you should be able to cut in a very small movement. It needs to be bigger a motion if you are less experienced. 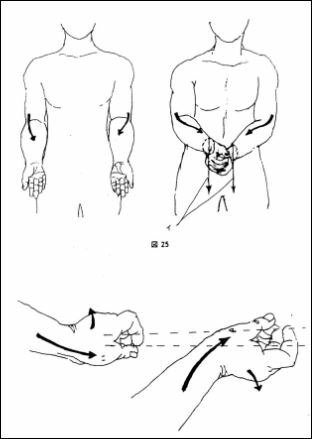 The key point is that the final part of the motion with your wrists is what gives the strike its “snap” and if your wrists are supple enough, you should be able to cut from almost a standing start. As Chiba sensei has said in the past, when you strike men, you should do so with the intention of cutting through to the chin. In terms of getting the foot movement part of the equation right, you should not move your right foot before you start the strike, however just before you do so, bend the right knee slightly. Not only can this provoke your opponent to move, it aligns your leg so that when you make a fumikomi stamp, you will painlessly hit the floor with the flat of your foot rather than risk bruising your heel. As simple as the theory might be, for many of us, it will take quite a few hours in the dojo before we can put it into practice.